Home Sweet Home Video is a full-service home inventory company based in Los Angeles, serving the entire U.S. In business since 2005, we are regularly referred to homeowners by Southern California’s top insurance brokers, business managers and real estate professionals. We are fully insured. Home Sweet Home Video has become the most trusted home inventory company in California. Busy homeowners rely on our trustworthiness and expertise to inventory their belongings. We use professional equipment and deliver an unparalleled final product that organizes the home contents in a way that is easy to sort and navigate. There is a reason this has been on your ‘to do’ list for years. This is not a Do-it-yourself project for most homeowners. 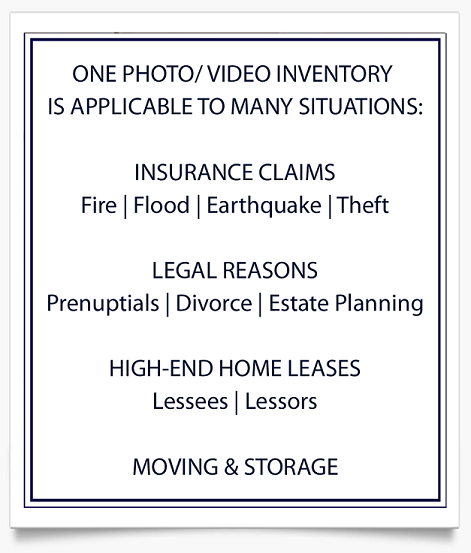 Doing your own home inventory requires proper equipment, knowledge of what should be documented and inventory software to organize your media in a way that’s accessible to your insurance agent or legal team. An independent, professional inventory validates the documentation to maximize insurance claim reimbursement and avoid legal issues down the road. Hiring a specialist to inventory your home is the best way to finally get the project done and done right. The relief a client feels when they are handed their entire property inventory on a flash drive is why we are so successful! On the day of inventory we walk the property with you to review your inventory needs. We document your contents, room by room, capturing items with multiple pans and tilts on high-definition video and many angles with our still camera. Once the shooting is complete, the bulk of the work continues at our office. For a photo inventory, photographs are assembled onto reports with descriptions of each item, including manufacturer, model and serial number (if accessible). All information is merged with our inventory software to create detailed reports for your safekeeping (delivered on flash drives as PDFs). For a video inventory, the HD video footage is organized and edited into chapters (delivered on flash drives as a .mov file). Flash drives are hand-delivered or shipped to the client. Amy Reiss has a background in television production and business management, which enables her to shoot the professional video and photographs as well as organize the media that comprise a thorough home inventory. Amy appeals to her clients not only for her respect for confidentiality but also for her sensitivity in shooting in such a sacred place – your home. As an owner operated business, Amy documents all of the properties herself.